After dolling up, we checked out the bars in the Waldorf. Not much was happening so we asked the friendly doorman, “Where is a nice place to have a drink?” He directed us to the Kimberly around the corner from the Waldorf. There we took the elevator to the top floor. The view of the Chrysler Building was outstanding. The crowd was far too young and beautiful. After taking some pictures, we settled on the comfortable sofa and ordered a vodka martini. The menu advertised the martinis as costing $14 each but we said, “What the hell. We’re in New York City.” The music was not to our liking. Linda remarked, “What we need is a piano bar with an older crowd.” I replied, “Look on your cell phone and find one in the area.” After paying our bar bill, the total with tax, title and license was $37.60. 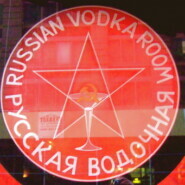 The Russian Vodka Room seemed perfect. We paid the astronomical bill and took a taxi to our new destination. The taxi driver was from Haiti. As we entered the bar, we knew we were in the right place. The people sitting at the bar were our age and friendly. We took the last two seats and ordered a two-ounce shot of vodka. I ordered the garlic and pepper vodka. Linda ordered the ginger vodka. The price was $7. Much more to our liking. We visited with Vladimir from Novosibirsk. The bartender was from Kazan, the capital of Tartarstan. Both places I had visited. Seated next to me was a girl from Virginia and a lady from Moldavia. Next to Linda was a screenwriter from Argentina. The conversation was global. We had found our spot. Before long we were sampling each other’s shots of vodka. They seemed hooked on the grapefruit. Linda switched flavors. I remained with the garlic and pepper. After all I didn’t plan on kissing anyone.